The truth seems to always contradict the Main Stream Media, but you are not surprised when you know who owns the Main Stream Media. Nelson Mandela was celebrated as a wonderful human being, a Nobel Peace Prize winner, and lauded as a saint of progress. 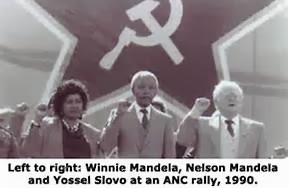 But how did we forget that he founded(along with his Jewish communist handler, Yossel Slovo) a communist terror organization (African National Congress - the ANC) that killed tens of thousands of people in South Africa? President Ronald Reagen declared them a Terror Organization in the 1980's, upon which list they remained until President George W. Bush removed them in 2008. It is truly amazing how the Main Stream Media ignores recent history, and maybe even more amazing how Americans forget recent history. Blame it on the floride in the water!! !